Resolution: Standard and Full Size I/C mortise cylinders on the L9485 and L9486, Hotel or Restroom Locks, use the concept of a ward ring to lock out all change keys once the deadbolt is thrown. Instead of a full ward ring, ½ of a ward ring or stop ring is used. This allows the key to rotate the plug in one direction to extend the deadbolt, but not in the other direction to retract the deadbolt. Depending on the hand of the door, the stop ring must be on the left or right side of the plug for the lock to function properly. 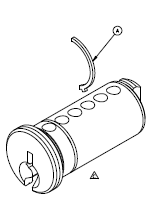 Consequently, handing should be specified when ordering these cylinders. The factory assembles each conventional hotel and Everest mortise cylinders with one stop ring. If you must change the handing just move the stop ring to the other side of the cylinder. A stop ring is installed on the right side for right hand operation and on the left side for left hand operation. Right hand shown below.